UFB Direct Bank is division of Axos Bank, formerly known as Bank of the Internet USA. UFB Direct is an online-only bank offering interest-bearing checking and savings accounts, as well as mortgages through its parent company. Who is UFB Direct Bank For? UFB Direct is an appropriate banking option for those who have higher balances but want low fees and competitive interest rates. It does not offer branches or ATMs, and instead offers an array of online banking services. UFB may also be a good fit for frequent fliers on American Airlines. Their offerings include one account that provides airline miles for every purchase made with a UFB-issued debit card. While UFB Direct offers enough account options to potentially serve as the only bank a customer needs, it still lacks the breadth of a full-service financial institution. All UFB Direct bank accounts are FDIC-insured up to $250,000. All you need in order to apply for an account is a valid ID and proof that you are a U.S. Citizen or legal resident, a social security number, and a valid address. Deposit checks with the UFB Direct mobile app or scan a check via the MyDeposit service. Online external funds transfer (for checking and money market savings accounts only). UFB Direct offers two savings account for customers: the UFB Direct High-Interest Savings Account and the UFB Direct Premium Savings Account. Both accounts are especially favorable for those with higher balances. With both accounts, you can get started with a $100 initial deposit and there is no monthly maintenance fee. Interest compounds daily. UFB Direct High-Interest Savings Account – Those with balances under $25,000 will receive an annual percentage yield of 0.20%. Those with balances of $20,000 or more will receive an APY of 1.3%. UFB Direct Premium Savings Account - Those with balances under $20,000 will receive an annual percentage yield of 0.20%. Those with $20,000 or more will receive an APY of 1%. 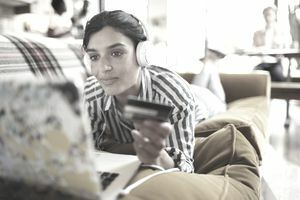 UFB Direct offers something that’s rather unique among banks: a money market account with competitive interest rates that also can serve as a checking account. The UFB Direct Premium Money Market Account offers an annual percentage yield of 0.5% for balances under $25,000. Customers with a balance of $25,000 or more will receive an APY of 2.3%, which is one of the highest rates in the nation. There is a $5,000 minimum deposit to open an account. There is no monthly maintenance fee if the balance stay above $5,000. Otherwise, the fee is $10 per month. Remember, this bank does not have any physical branches. So in order to make a deposit, UFB Direct customers can take a photo of a check and deposit it using the UFB Direct mobile app (see more details below), or mail checks using postage-paid envelopes provided by the bank. If you deposit a check, the first $200 will be available on the next business day. The remaining funds will become available on the second business day. For example, if you were to deposit a check of $1,000 on Monday, $200 of the deposit would be available on Tuesday and the remaining $800 would be available on Wednesday. In lieu of offering interest, the Airline Rewards Checking account dishes out airline miles for every debit card purchase made through a partnership with American Airlines. You can get one airline point for every $3 you spend, up to a maximum of 120,000 points per year. UFB Direct says it may offer miles for additional airlines in the future. UFB does not offer a robust selection of credit cards, but it will issue customers a Visa debit card upon request, which can be used as an ATM card. If you use the card at an ATM, you may be charged a fee by other financial institutions, but those fees can be reimbursed by UFB. Cash withdrawal at an ATM: $1,010. Through its parent company, Axos Bank, UFB Direct offers mortgage loans to prospective homebuyers, as well as home equity loans and refinancing of existing loans. As of January 2019, the bank offers fixed-rate loans with interest rates slightly above 5.3% —higher than the national average and most of UFB's online competitors. UFB Direct Mobile App – The UFB Direct mobile app is available at the Apple iTunes or Google Play store. The app allows customers to check account balances, transfer money between accounts, view transactions, locate an ATM, and contact customer service. Customers can also deposit money through the MyDeposit feature of the app. MyDeposit –Using this service, customers can scan an image of a check and deposit it directly. They can scan only one check at a time, and can deposit no more than $10,000 per day or $50,000 in a 30-day period. PopMoney – This is service similar to PayPal that allows customers to send or receive money via email or text message. To send money, you can log in to your online bank account and enter a recipient’s email address or phone number. To receive money, you will get an email or text message notifying you that someone has sent you money. You can then log in to your bank account and direct the funds there. You can also provide bank account information on PopMoney.com. Online Bill Pay – Avoid writing checks or going to multiple websites, and pay bills through the UFB Direct website. All you need to do is enter the account information for each payment recipient. Text Message Banking – Account holders can subscribe to receive their balance and transfer funds between eligible accounts via an SMS text message. UFB Direct is the online subsidiary of Axos Bank, formerly known as Bank of the Internet USA. The parent company was founded in 2000 in San Diego and re-branded as Axos Bank in October, 2018. Axos trades on the New York Stock Exchange under the ticket symbol AX. Axos has $9.8 billion in assets under control; it does not break out financial figures of UFB Direct. UFB Direct offers checking, savings, and money market accounts, plus mortgages exclusively online. UFB Direct is a solid bank for people who want competitive interest rates, limited fees, and a simple banking experience. While it lacks many of the offerings of a full-service bank, it could serve as the only bank customers need. Its interest-bearing checking account offering is somewhat unique among online-only banks, which typically offer only savings accounts. UFB’s Airline Miles account is also an unusual and appealing offering for frequent travelers. It’s also uncommon for online banks to offer mortgages. UFB customers will not have access to bank branches or ATMs, so they must be comfortable with an online-only experience. This bank offers competitive interest rates, particularly on its Premium Money Market Account, ut all accounts only offer the best rates to those customers with large balances. In addition, UFB places limits on the number of withdrawals you can make each month, which some customers may find too restrictive.